I love the Holidays for many reasons, but spending time with those dear to me has to be at the top of the list. 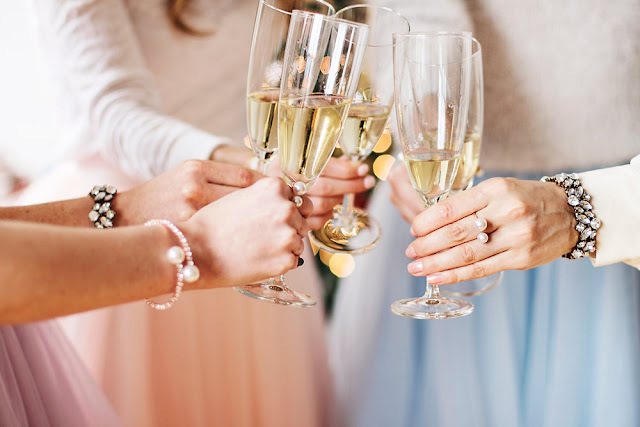 The blogging world, which can be daunting and isolating at times, has brought me close to some incredibly inspiring ladies, who are just as beautiful on the inside as they are on the outside, and this Holiday season we had a goal to get together to create something extra special. It's so nice to have found a group of ladies to relate to and share in the excitement of blogging, bounce ideas off of and ask for advice. We wanted this "something" to be girly, sparkly and all around fun, because if you can't dance around to Christmas carols while sipping champagne and nibbling on cotton candy during the Holidays, when can you?! 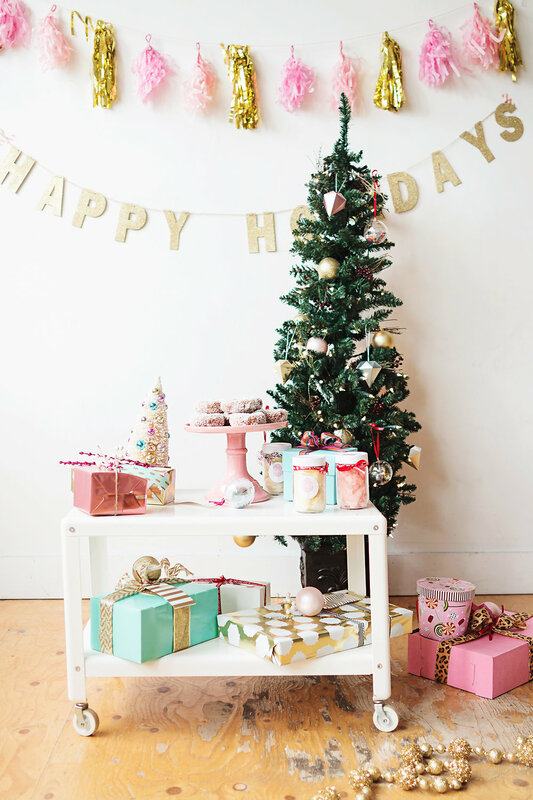 Not only did we want to get together over the Holidays, but we wanted to showcase some extremely talented local brands all while having an excuse to put on pretty skirts, and eat sweets. Before I introduce you to these brands, I want to introduce you to these lovely, supportive ladies who make blogging so much more fun! The Blondielocks: Like her skirt and blue floral crown suggest, Kaylee is a modern day Cinderella-- so naturally pretty and kind hearted! 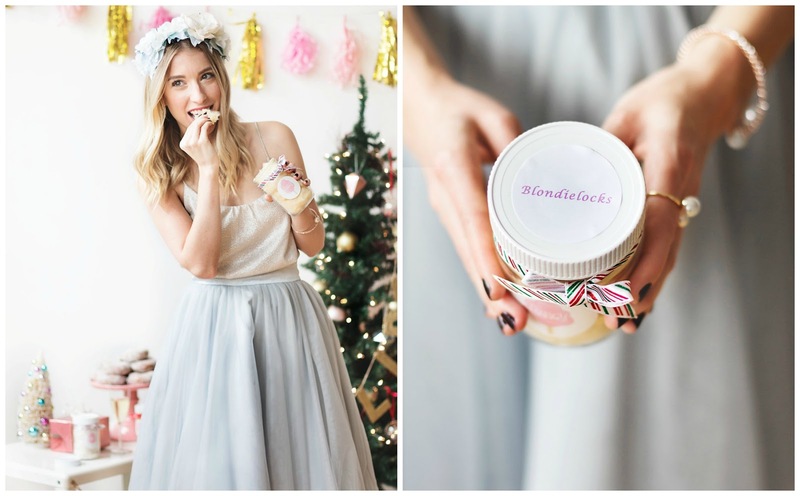 On The Blondielocks you will find stunning photos of everything from her amazing style, to DIY ideas, top beauty picks, recipes and more! La Petite Noob: Not only is her hair always curled to perfection and her eyes so blue and beautiful, Joëlle is so sweet and encouraging. On La Petite Noob you can follow along on this flower loving, coffee drinking adventurer. Find everything from wicked style, tips on how to pack for Europe in a carry on, and how to curl said perfect hair! Bijuleni: Eleni is a true Grecian goddess, with a touch of Parisian poise. She is filled with so much vibrant energy and is just a natural in front of the camera. Bijuleni is a colourful reflection of her fab style, with an added touch of relatable real talk and humour. Curated by Amy: Amy always makes me laugh with her quick wit. Aside from being gorgeous, she has a true artistic side and a hand bag collection that is to die for! On Curated by Amy you will get to see said handbag collection first hand and her incredible style. 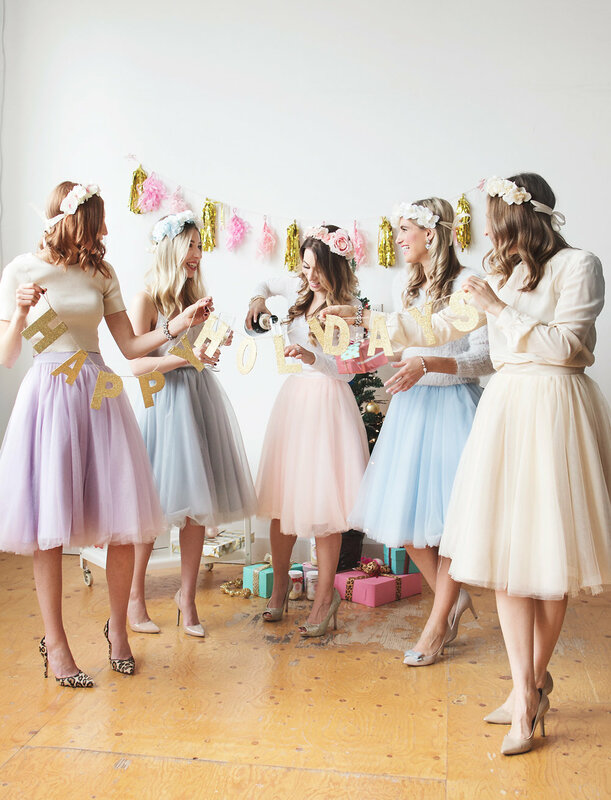 Pastel Dress Party: This whole idea was kind of inspired by these fabulous tulle skirts. 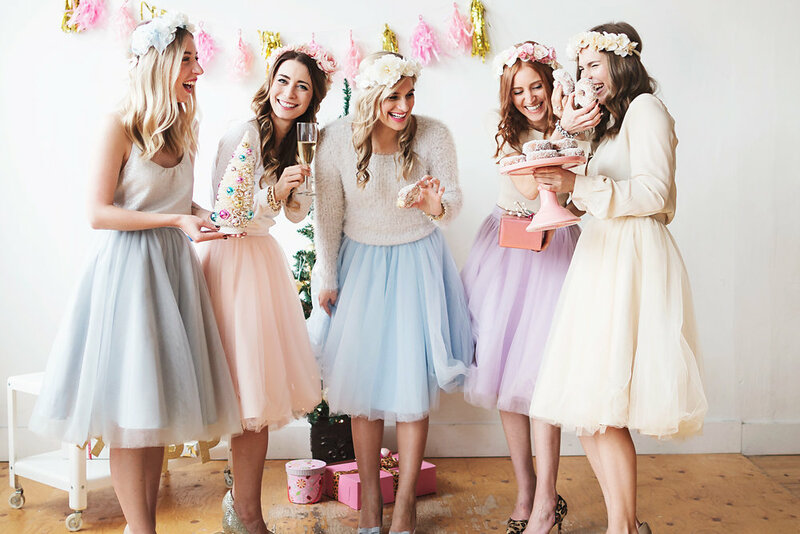 Pastel Dress Party brings beautifully crafted, affordable, custom dresses and skirts to the every girl and for every occasion. 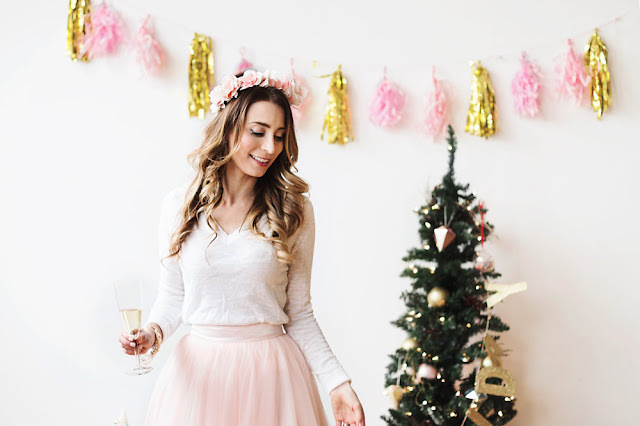 They have a variety of different styles of dresses and skirts for any occasion, and you can seriously customize them to your exact liking and size. 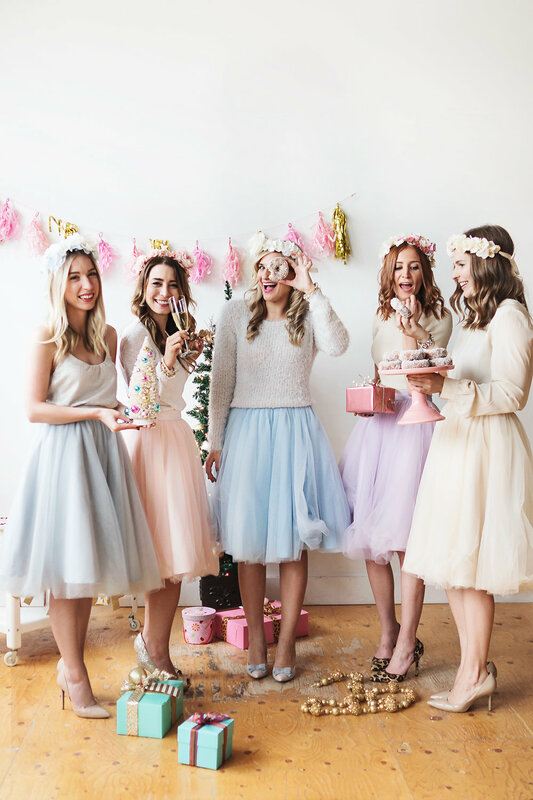 We went with tulle and loved having the chance to feel like princesses for a day. Fancy Pufs: I just love working with Fancy Pufs (catch our last collab here)! 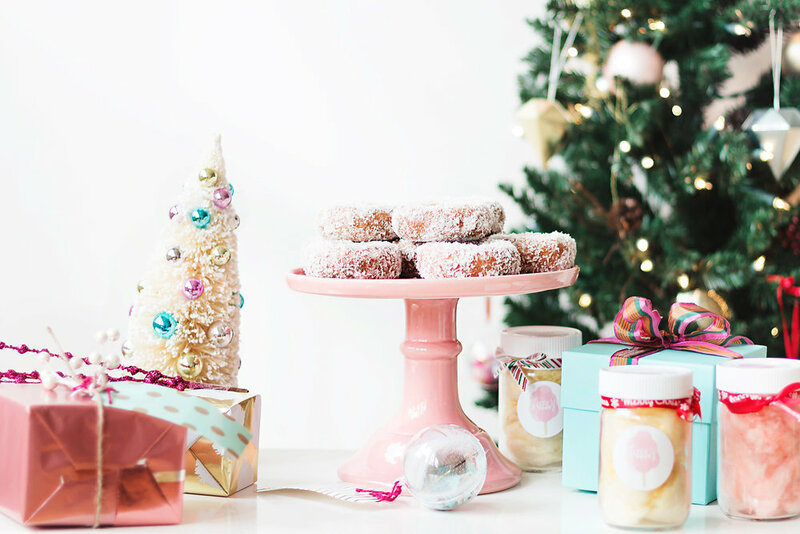 Using all naturally flavoured, organic, and gluten free sugars, Fancy Pufs creates the most delicious flavours of cotton candy you could ever imagine-- hello birthday cake! 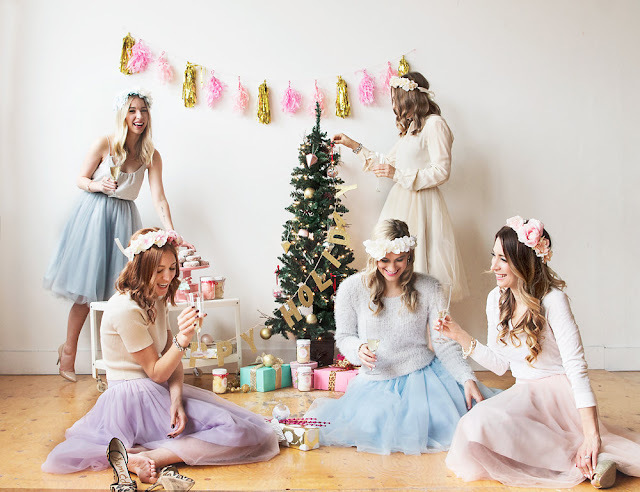 Fancy Pufs serves Toronto with the finest pufs; you can order the cart and have a pufista spin your event, or you can create customized favours and keepsakes for your guests or offer as gifts. 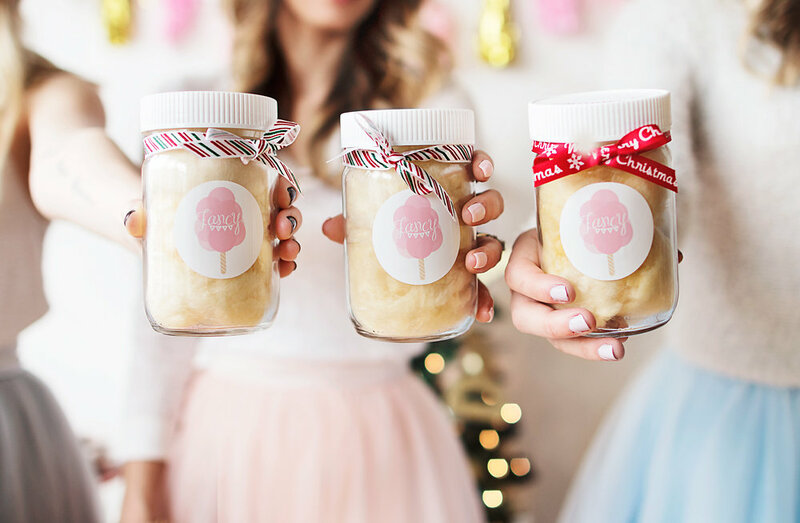 Our mini jars of Holiday flavoured cotton candy were such a sweet addition. They were labelled for our blogs and kept our bellies happy all day. The gingerbread flavour was my favourite! Cherrypick: There is no doubt you will be making a statement with Cherrypick. Each piece of finely designed and crafted jewellery is stunning and will most definitely have everyone asking "where did you get that?". So sparkly, on trend, and will fit the bill. 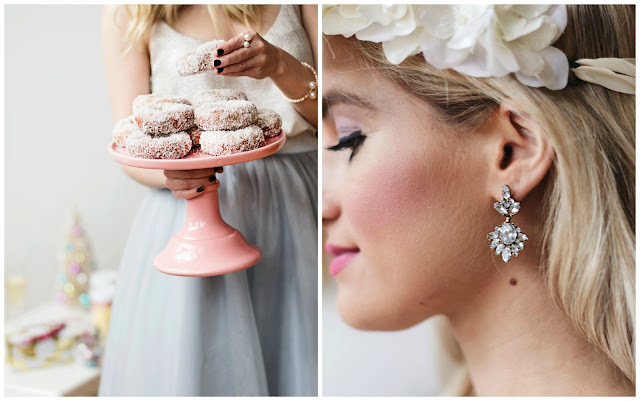 I love that you can style the jewels for any event-- the fanciest of affairs to the days where you just need a little something extra. And what's the Holidays without a little bling?! Flower Maiden Florals: This floral queen is a true artist. Each piece was individually designed and made to order with the most delicate care and intricate detail taken into account. 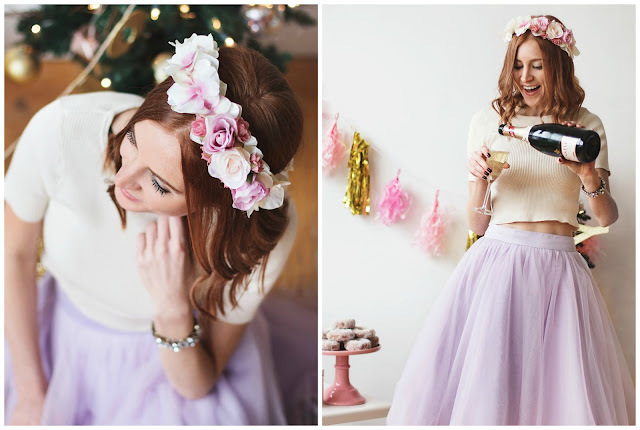 Looking for a floral headpiece for any occasion? Check. Looking for a set of bouquets or arrangements for your next event? Olivia's your girl. Her work is stunning and I'm already looking for another excuse to wear this crown again! And the lady who captured the true essence of our day through these stunning photographs? Raelene Giffen of Raelene Giffen Photography. Looking at these photos for the first time amazed me. Raelene is not only incredibly talented, but she is the sweetest. And I mean the sweetest! I couldn't have imagined a better experience. Her bubbly personality made me instantly feel comfortable in front of the camera, and had us all feeling so natural by the end of it. She splits her time between Halifax and Toronto so be sure to check her out. A true rising star! This whole day really couldn't have come together without these amazing ladies and inspiring local brands. We loved having the opportunity to showcase brands and people that are killing it at what they do right here in our backyard. 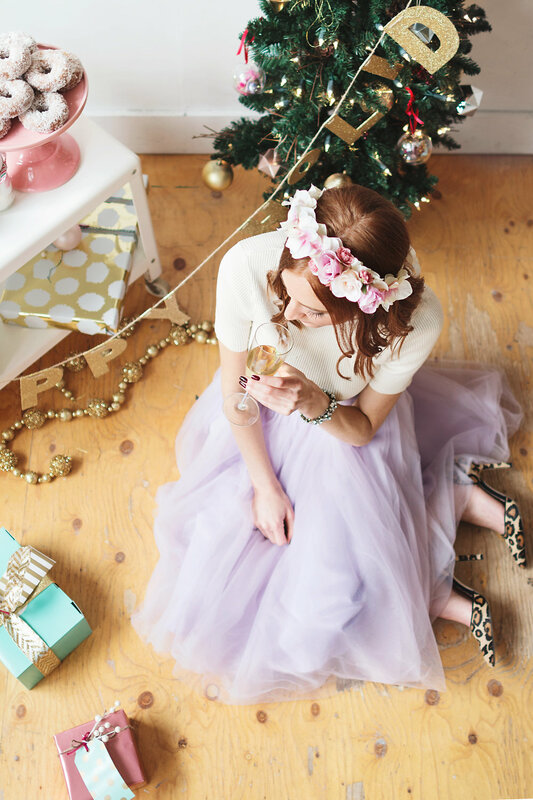 Come away to our little pastel dream land, where pretty florals, sugar, bling and bubbly make some serious Holiday magic. And please do let me hear your thoughts! 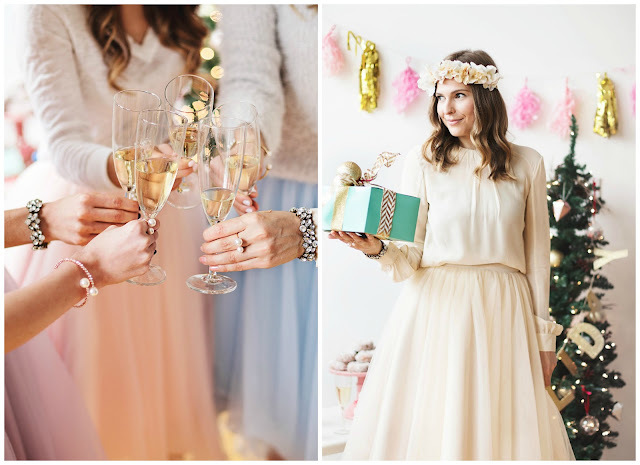 I absolutely love everything about this shoot!! All of you look gorgeous, the outfits and accessories are perfect....and who doesn't love to support local? Aww thanks so much, Jackie! I'm so glad you like the photos! It really is so important to support local. Love that you think so, too! Ah, I love reading everyone's post. They are all so different yet the same, and you are so sweet!! Such a fun photo shoot. Wish all the shoots were this much fun.lol. I know! What a sweet day! Love working with you! Thanks so much for sweetening up our shoot! Still thinking about that gingerbread cotton candy blend! You are absolutely the sweetest Gabriella! I'm so grateful to have met such a talented and supportive lady like yourself, and am proud that we're all on the same #Blogsquad. Looking forward to future projects! Me too! Can't wait to see what is in store next!